You can see I added the sub-roof cardboard because as we all know the CI has to be taped to something. The underside was painted Black before it was glued in placed and the top is drying now. You might also noticed tha I aged some of the shingles of the ice house under the overhang. I did this because I think it would age slower since it is covered. The rest of the ice house will be weather after the ice house is attached to the slaughter house so that I can treat both roofs so that while the ice house will look newer they both are enduring the same stimuli of weather. When the sub-roof and CI is up there it will look more like the black portion on the left of the currently building roof. Whereas the camera can't pick up the truss detail the eye can. Next is to repair two skylights and a vent or maybe build two stair cases from the ground to the docks. Don't forget the wind break roof on the side. Mike & Horse, Thank you. No wind brakes here, The coastal hill that make the bay also create a dead zone on this shore, Now on the eastern side of the bay they might be a good idea. I was given a gift that has taken most of my free time to dispose of but I will have a small update later. This sentence about the gift is indeed rather mysterious. Apart from this, this building is looking very nice, Bob, the kind of intricate structure many of us love to watch and watch. When I said wind break, I was referring to the partial roof over the walkway from the meat loading dock, on the side for protection of the workers from rain, etc. First, Thank you all for the support. It is most appreciated. Notice the new handrail match the old? That wasn't easy. I built this slaughter house over 25 years ago. I was using Floquil Paints almost exclusively. I have many bottles of Floquil squirreled away. Would I have this one? It turned out that It was Penn-Central green that I used on the trim. And I did have a bottle. Horse, you're right this walkway needs more protection from the elements. I must engineer something. Third, the "Gift". I have previously mention my friend the picker who occasionally donates to me any HO stuff that he can't sell. That's how I got my CM roundhouse. He dropped off 6 cases of MR and MRC magazines for my enjoyment. I recycle my own collection of magazine years ago after picking out anything I thought I would need and I thought that these too would get a quick trip to the recycle bin. However most of them were for the years I had never owned. So I've had to go through them for any gems before they were recycled. I got about a 1/2" of new material. For example; I only had the first article on the very influential Thatcher's inlet. Now I have all four. And here's another gem. 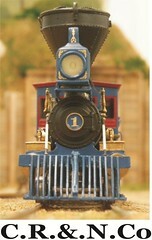 Taken in her last years of running before being displayed in Arcadia and then donated to the Pennsylvanian Museum, the Tahoe. I'm now working on the vent, lower dock access stairs of the ice house and writing this as paint dries. Yes, the Thatchers Inlet series was neat. I can relate to that Mike. I like seeing how the hobby has evolved over the years. From the way we design track plans to the finer scenery materials we have today. And Yes, for me, not all the changes have been positive but, for me it came down to space and clutter. I still have a few old books to remind me of the Jurassic days. I'm now working on the Ice House Vent. After I Shingle the roof of this vent I will join the two building together and finish laying the ice house roof. I will then weather the ice house roofs to be consistent with the Slaughter houses roofs. I will then turn my attention back to the other side of the building where I will spruce up the boiler house and the ramp leading to oblivion and then put the water tank back on the roof leaving only the pens and a billboard for the right side of the slaughter house's roof. Looking great Bob! It's quite complex. Nice touch with the vents. I sorted out my magazines years ago. When I was a teenager I had a teacher who was deep into American N scale and had an extensive magazine collection which I managed to acquire. But after several moves I finally sorted out the goodies (earlyrail stuff) and gave away the rest to charity. But I saved one or two old ones. It is like with old books, its a special feeling reading them and I love the smell of them. Beats a reading pad everyday. I appreciate your kind words. I too prefer a book to a tablet but, when it comes to research I find a tablet faster at times. And I added guild lines to the smoke stack. But I don't know if I like them yet. For sure, they need some weathering. You see, It's not really functional as it is now.You really can't just back a wagon up to it squarely. This is the door where all the disgusting "by-products" that can't be burned in the boilers are shipped out. We don't want any of that to spill in front of the offices do we. I also have to extended the CI roof over the walkway here about two feet.